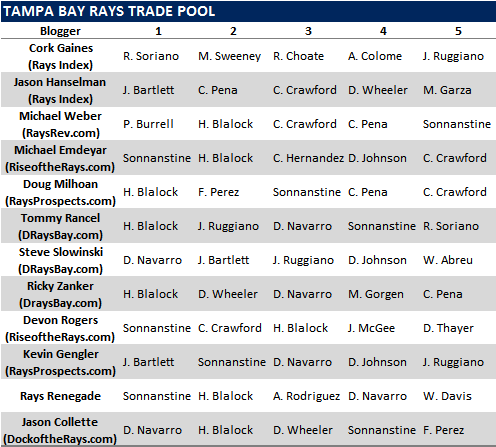 Welcome to the 2nd Annual Tampa Bay Rays Trade Pool where members of the Rays blogosphere determine who is the best at predicting which members of the Rays organization will be traded this season (this contest is based loosely on the “Dead Pool“). Each blogger submitted a list of 5 players they believe have the greatest chance to be traded this season. All players in the organization are eligible. The bloggers ranked those 5 players, giving the highest rank (#1) to the player they think is most likely to be traded. If one of the players they chose is traded prior to the end of the season, that blogger will receive points based on where the blogger ranked the player. If Carl Crawford is traded and a blogger has CC ranked first, they will receive 5 points. If they have CC ranked second, they will receive 4 points and so on. The blogger with the most points at the end of the season wins. We also want YOUR lists in the comments. Let’s see if you guys can beat the experts. And by “experts” we of course mean a bunch of people with too much free time on their hands. 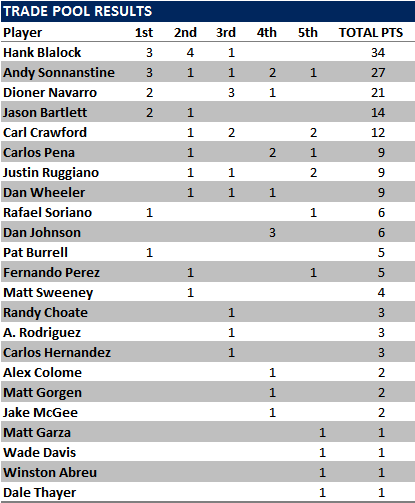 Three of the 10 bloggers picked Hank Blalock as the most likely player to be traded, and three picked Andy Sonnanstine. Twenty-three different players showed up on at least one list. The difficulty in these rankings is predicting whether the Rays will be “buyers” or “sellers” this season. If they are in the playoff hunt, they are more likely to trade prospects. If they fall off the pace they are more likely to try and move expensive veterans. Hank Blalock and Andy Sonnanstine each appeared on the most lists (6). 10 different players appeared on more than one list. Jason Collette of Dock of the Rays. Also, you might be asking “What does the winner receive?” We have no idea. Any suggestions? This is tricky. The guys the Rays would like to dump if anyone would take them (Navi, Burrell, possibly Wheeler) don't produce enough relative to their salary or they'd be gone already. This year is too important and the Rays are playing too well for them to deal any of the MLers other teams would take (Pena, Crawford, Soriano, Bartlett). The youngsters other teams might covet (Brignac, Joyce, Sean Rod) are even more valuable to the future of the Rays than they would be to most other teams. I see the Rays dealing from an area of strength (young arms) to help bolster the bullpen later on this year, if anything, so I'll go mostly with moveable young arms. They won't part with any of their A-grade pitchers (Moore, Lobstein, Barnese) but I could see one or two of the B to B+ arms being dealt. You and I approached this almost the exact same way. I originally had Aneury on my list, but then thought he might actually be too good now to be traded for a relief pitcher. But I might be blinded by his last 2 starts. And nothing says it would have to be just a relief pitcher. Maybe they get a catching prospect thrown in. Now I'm kicking myself for taking Aneury off. Anyway, yeah, I was trying to think what they would be willing to part with for relief help. That's where Colome, Ruggiano and Sweeney come in. As for Soriano, if the Rays fall off the pace, I just think trading him is a guarantee. Not that I think they will fall off the pace. Just that he is more of a sure-thing than any of their "buying" pieces. "He's several years away, but Colome has the makings of a potential ace. His current stuff is already electric, and his build and loose arm offer projection still. He'll look to take another step forward with his control and command in 2010 with Bowling Green, where he'll replace Matt Moore as the ace of the Hot Rods' rotation. I think there are some similarities between those two pitchers: Both had high strikeout rates(Moore's are higher) and both improved their control in their second (state-side) season(Moore from 7.1 to 3.1, Colome from 5.1 to 3.8, and on a coincidental note, each had 1.66 ERAs in their second pro seasons). Moore needed some time to adjust with Bowling Green, it'll be interesting to see if the same happens with Colome." You wanna trade this kid for a reliever? For a 38-year old, 2 month rental? No. But for a lefty or a flame-throwing righty with 4 or 5 years of team control? Yeah, I'd probably part with my 3rd or 4th best pitching prospect that is still a few years away from the big leagues. I got to say the list is already impressive, and I guess I can throw my nickel's worth out there too. Number 5 might seem a bit out there, but Jeremy Hellickson and (if not traded) Aneury Rodriguez will be knocking hard on the Rays pitching staff door in Spring 2011. Davis might be the one pitching option ( like Mitch Talbot this off season) who could evolve more in another locale. Rays will be buying relief pitching if they do trade. I was praying they would be buying a catcher, now the way Jaso is playing I'll be praying Dioner will be gone when Shoppach returns, whether it's a trade (who the hell would take him? that's why he's not on my list) or DFO. During the Red Sox series, Staats mentioned that Crawford hadn't been caught stealing by Boston since Varitek got him in 2005 (or whatever it was). Without missing a beat, B.A. says, "He must have fallen down." I don't think it was soda I was drinking at the time, but there was definitely some nasal discharge. Why is Bartlett so high? I haven't heard anything about the Rays trading him. I'd imagine that Bartlett is high because of guys like Brignac, Zobrist, S. Rodriguez, and Aybar all being middle infielders, but i'm w/ you haven't heard a thing, and I don't think it'll happen, I don't see any one of the 25 man roster guys going any where with the exception of Sonny, and that's only because another team could see him as a middle/back of the rotation guy and give the Rays someone good for him. I don't want to even think about the Rays falling off the pace so I will not list Soriano, Peña, or Crawford. I think some of you are combining this list with those you anticipate not being here in 2011 with those that will be traded...that being said nobody wanted Blalock when he was sent down, don't see us getting much for him...2 guidelines the front office seems to follow is 1) don't trade pitching or defense (until they have given up on the project ie EJ) 2) injuries happen, so they won't move someone on the 25 man that is seeing time today. Sonny and Navy, fall in the 1st boat and I think with Perez, Joyce, Ruggiano all waiting for CC to be in Pin Stripes next year, 1 of them could be gone if the Rays had needs closer to the dead line. Good call on Blalock. I wasn't even thinking of him, but he's basically in the same boat as Kennedy last year.